Beginning in the Fall 2013 semester, all interested Pratt Institute undergraduates may declare for a minor in Sustainability Studies. The minor in Sustainability Studies at Pratt deepens the understanding of the interdisciplinary approach to sustainable environmental, economic, and social practices, providing students with a broad understanding of the complex interrelationships between humans and ecosystems and the best practices for protecting environmental quality and fostering social equity. The minor can be combined with any undergraduate major and requires the completion of 15 credits approved in Sustainability Studies. Two 200-level courses are required for all students in the minor. Students are required to take the common core course SUST 201 The Sustainable Core as well as MSCI 270 Ecology (or the equivalent MSCI 271 for Architecture majors, or MSCI 280 for Construction Management majors), as these two courses provide foundations in ecological literacy, social justice, and environmental justice. SUST 201 The Sustainable Core, which I will teach this fall Monday afternoons from 2-4:50pm, involves the participation of faculty from several other departments at Pratt as guest lecturers. This gives students the sense of how particular professions (such as industrial design or architecture) relate to broader socio-environmental issues including fair trade, zero waste practices, and environmental justice. I am delighted to co-ordinate this new minor. When I decided to come to Pratt last year, the Institute’s existing sustainability initiatives included incubation of startup firms devoted to sustainability, community outreach both in its immediate Brooklyn environs and throughout New York City, graduate programs on planning and facilities management, a center for sustainable design studies, and a plethora of undergraduate courses approaching sustainability from disciplines ranging from architecture to philosophy. This new minor shapes an interdisciplinary program from several of those courses,providing students a broad overview of sustainability problems, concerns, values, and approaches. For me, the chance to introduce this minor is irresistible. My work is concerned with the consequences of consumption and waste on the environment and society, including unintended consequences of the disposal of mass-produced goods, stigma associated with handing wastes, and particular attention to the ways in which attitudes concerning waste and society shape each other over time. Pratt students are creative leaders who shape art, fashion, industrial design, and the built environment in ways that will affect consumption and waste streams long after I am gone. The minor, as well as SUST 201, SUST 401, and SUST 405, are unusually vivid opportunities for this historian to apply my training and concerns to improve the future. I look forward to working with the initial cohort of interested undergraduates, and students curious about the minor may contact me with questions. This entry was posted in students, teaching on May 22, 2013 by Carl Zimring. Geoffrey Baer is a deceptively brilliant tour guide. He has spent decades giving tours of Chicago’s architecture, and his friendly, conversational style has made several WTTW documentaries about Chicago architecture, history, society, and food that are both scholarly and popular. With his longtime producer Dan Protess, Baer has now developed the first national version of this documentary style. 10 Buildings That Changed America aired on PBS this week, and it is both a wonderful continuation of the Chicago documentaries and an astonishing step forward. 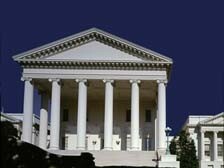 Thomas Jefferson’s Virginia State Capitol (1788), featured in 10 Buildings That Changed America. The continuity lies in the exhaustive research behind the show that somehow never feels exhausting. The scripts tell coherent stories about what architects such as Louis Sullivan, Frank Lloyd Wright, Robert Venturi and Denise Scott Brown, and Frank Gehry experienced as they developed their landmark buildings. The architects are people living in particular times and places, acting and reacting to significant changes around them. Sometimes their reactions produced unintended consequences, and those are discussed at length by a wonderful array of historians and critics. Architecture enthusiasts will recognize Paul Goldberger, and speaking as a historian, I was delighted to see Gwendolyn Wright, Charlie Hyde (the commentator on my first ASEH panel) and Tim Samuelson among the many interview subjects. 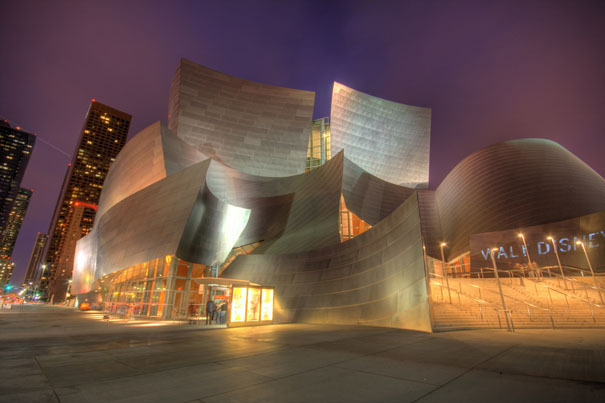 Frank Gehry’s Walt Disney Concert Hall (2003), featured in 10 Buildings That Changed America. The step forward is in the scope and pace. Where Baer’s earlier documentaries put the greater Chicago area under the microscope, this one has a truly national scale. Arranged chronologically, the buildings tell a story of the United States, from founding father Thomas Jefferson’s visions of a new architecture for a new nation, moving coast to coast through the nineteenth century’s new churches in Boston, skyscrapers in Manhattan, Chicago, and west to St. Louis (along with the prairie architecture of Frank Lloyd Wright), the advances of the Industrial Revolution (and Fordism) and the reactions to nationalism, internationalism, postwar consumerism, and modernity in the twentieth century before finishing the journey with Frank Gehry’s Walt Disney Concert Hall in Los Angeles. Although each of the ten segments focuses on one building, every segment shows how that one building both came from previous influences and then influenced other buildings. This is a video textbook of American architectural history, one which places the built environment squarely in the social, cultural, political, and technological history of the nation. Frank Lloyd Wright’s Robie House (1909), featured in 10 Buildings That Changed America. All this takes place in 56 minutes. The pace of 10 Buildings That Changed America is much faster than any of the earlier Baer/Protess productions with astonishingly quick editing throughout the program. Blink during the Louis Sullivan segment, and you’ll miss Baer walking alongside the Auditorium Building (complete with advertisement to enroll in Roosevelt University, the resident of Sullivan’s Michigan Avenue masterpiece since just after World War II). Blink during the segment on Robie House and you’ll miss many of the Frank Lloyd Wright houses that pepper Oak Park. (Some of these are featured on this Saturday’s annual Wright Plus architecture tour. My wife and I worked on the past two Wright Plus tours and missing this one was a lamentable result of my moving from Roosevelt University to the Pratt Institute.) The scope of these brief edits is enormous; I would not be surprised if more than one hundred buildings are included overall. If you stop to think about how many images and interview subjects are in this episode, you will be amazed at how dense it is with visual and verbal information. That is only if you stop and think, for the result never feels rushed or clausterphobic, merely conversational. The deceptively brilliant accessibility of the Baer/Protess documentaries endures. The Adam J. Lewis Center at Oberlin College (2001) did not make the list. The result is a program that any student of architecture should watch and that any student of American history ought to enjoy. The selection of these ten buildings will no doubt inspire debate, as will the producers’ online list of ten more buildings of note. I have only one criticism. 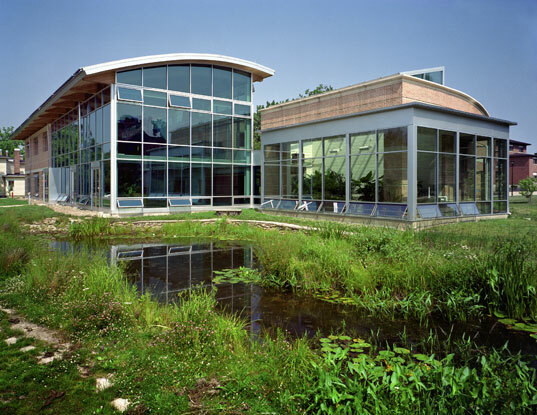 I hope that a future edition of this program will include William McDonough and David Orr’s Adam J. Lewis Center at Oberlin College (2001) as a vision which has influenced environmentally-sustainable architecture not simply as a straightjacket (as Stanley Tigerman has criticized the U.S. Green Building Council’s LEED rating system), but a genuine expression of how the built and natural environments may interact. (I am biased as a former teacher in and neighbor of the building, but I have also seen its influence grow in buildings striving for passivhaus, LEED, and Living Building Challenge performance over the past decade.) The concluding montage of images in the show included a glimpse of Jeanne Gang’s Aqua Tower (2009), an example of biomimicry, but a discussion of inspired buildings designed for sustainable performance would be a fitting coda to the discussion of Frank Lloyd Wright’s attempts to build houses to suit the Midwestern prairies. That point is my only regret about 10 Buildings That Changed America, and it is less a regret than a demand for more. Here is hoping that the audience for this impressive tour of American history leads to more national programs from Geoffrey Baer and Dan Protess. See the episode. If you like it, WTTW would appreciate a donation as gratitude. This entry was posted in history on May 16, 2013 by Carl Zimring. A comprehensive understanding of the social construction of waste requires consideration of both the discarded objects themselves and the people whose business it is to discard or reprocess the objects. We occasionally recognize the importance of waste-trade workers, especially when there is a garbage hauler’s strike or other crisis. Without their daily labors, the orderly removal of wastes breaks down. Despite their importance, the waste trades rarely have garnered respect. To call waste-trade labor “dirty work” is not novel, for waste handling involves unsanitary conditions. Stuart Perry titled a 1998 study of San Francisco garbage haulers Collecting Garbage: Dirty Work, Clean Jobs, Proud People. In Perry’s conception, the work is low-status, high-risk, and physically dirty, but also honorable and necessary. 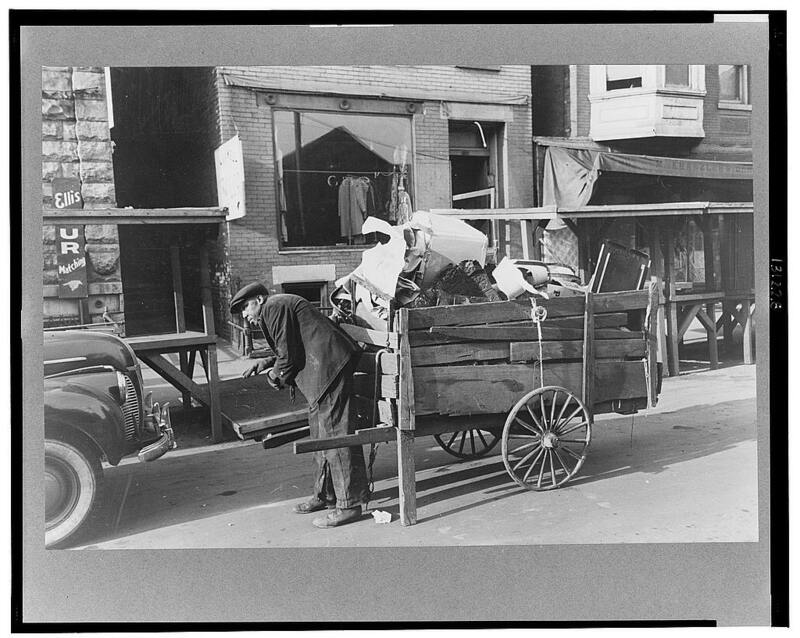 Perry’s study rightly emphasizes the importance of garbage hauling, but it does not examine the many ways in which garbage haulers and related occupations are seen as dirty. The term “dirty work” may be expanded to include other connotations of dirty behavior. The dirtiness of the waste trades extends beyond issues of sanitation to include notions of ethics and xenophobia. Garbage hauling, toxic-waste storage, and scrap dealing are three waste industries whose images are associated with crime; not coincidentally, they also are associated strongly with ethnic groups who migrated to the United States in large numbers between 1870 and World War I. Contemporary cultural examples abound: Anthony Soprano from HBO’s The Sopranos uses a garbage-hauling business as a front for his mafia operations, mirroring reports of toxic waste handlers being prosecuted for mafia-related activities over the past two decades. The most recent Star Wars films featured a scheming, hook-nosed, seemingly Semitic junk dealer who enslaves the young boy who grows up to be Darth Vader. Scrap and garbage are linked to identifiable ethnic and criminal identities in popular culture, a link that—justified or not—is both strong and long-lasting in American history. The article goes on to examine xenophobic attitudes by reformers, political bodies, and the customers of scrap dealers, establishing links between public health and safety and unscrupulous practices involving waste materials. Those concerns led to restrictions on who could trade scrap, where it could be traded, where it could be processed, and where it could be stored. This article has a more narrow focus than that. But it’s a good place to start the conversation. This entry was posted in history, recycling, waste on May 16, 2013 by Carl Zimring. How Do You Get to Radio City Music Hall? Grade. Shot of the Radio City Music Hall stage before the Pratt faculty walked onto it at graduation. I never had the ambition to sing at Radio City Music Hall in front of a full crowd. But that’s what happened today. 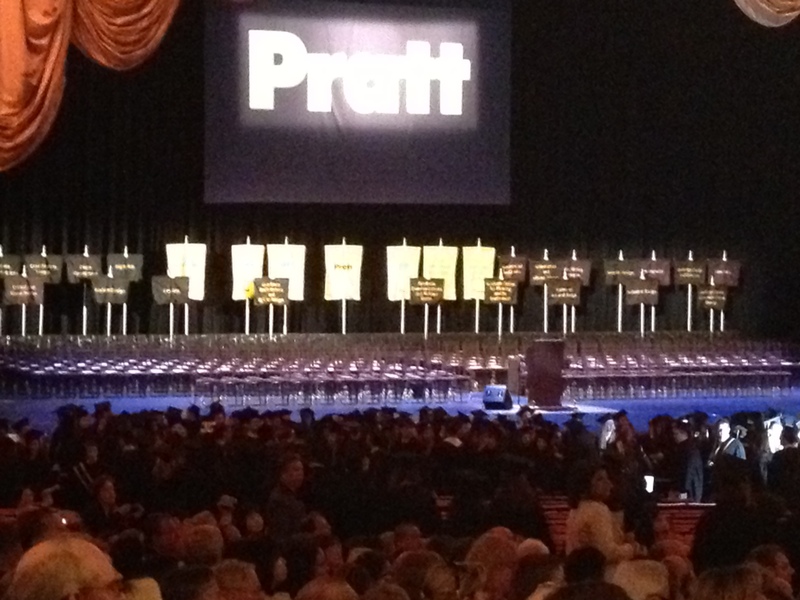 Pratt’s 124th commencement ceremony took place at Radio City Music Hall. To ensure enough seats for the friends and families of graduates, all faculty attending were seated onstage behind the podium. Thus, I can legitimately say that my profession took me to the stage of Radio City Music Hall. But that wasn’t the best part of the day. The best part of the day was spent watching several of my students accept deserved congratulations for finishing their degrees. Ranging from fine arts to architecture majors, if the work I saw from them this year is any indication, these students have bright futures ahead of them. I also was pleased to find that several of them took public transportation to the venue, as the G and M trains were packed with students in caps and gowns. That first step out of the academy is a small one, carbon-wise. Trustee/Studio 360 host Kurt Anderson gave the commencement address, and then the assembled faculty onstage (myself included) sang the Pratt Alma Mater to close the proceedings. I cannot confirm the rumor that future commencements will be held at Brooklyn’s Barclay Center because the staff of Radio City Music Hall heard my vocal contribution to the proceedings. Congratulations again to the class of 2013. Those of us who taught you look forward to see what you do in the years ahead. This entry was posted in events on May 14, 2013 by Carl Zimring.